22" span and 19" chord. Might be a little spicier than the Nutball I just finished. Same power setup but the wing loading is higher. If all goes well I may render the design in wood at about 30' span. The leading edge is 8.5" wide. Total wing area is about 300 sq in. I left the spine long but with the servos on the CG didn't need it. If the area is about 330 sq in, then "average chord" is 13-3/4". Making an aspect ratio of 1-3/4:1. Weight is around 400g, so loading (conventional) of 5oz/sq ft - and WCL is 4oz / cu ft. I wasn't going to do this one just yet, but, I got one of my models out the shed (the micro Pronto) only to discover the fuselage had made a delightful warm nest for a mouse at some stage over the past months. Fortunately he hadn't nibbled anything expensive so all the running gear was ok, the only things eaten were three servo extension cables and the cling film I had wrapped my plasticine nose ballast in. You would have thought the balsa would have been tastier but that's mice for you I suppose. As the thread description hints, this is really a prototype to test the water. If all goes well I have a rather nice Mega inrunner that would be a good fit for a 2.5lb (ish) wood version of around 30" span (my previous hack speed model having experienced a slight structural degredation upon undergoing an abnormally quick landing). ...and, maiden done. About 12hrs after first getting the knife out - something of a record for me. Well, I like it. Excellent return on work invested! A bit twitchy to begin with (I had large movements set) and a bit out of trim (the foamboard is not especially flat) but once trimmed out it was all very nice. Does a decent loop - needs to kept moving at a reasonable lick - and rolls like an electric drill. Will sit in high alpha OK, although it wanders of course and there is no rudder to bring it back. It has the usual low aspect wing's mushy stall. Inverted needed a fair amount of down, so perhaps I have a slightly forward CG. Turns can be wide or tight, if tight then it exhibits the mushy stall before being pulled out by the motor. The tail 'wags' a little when moving more rapidly. I think slightly more fin area is needed. I might try sticking on an extension. Or adding a rudder, or something. It definitely needs a different prop, the 7x4 is too low pitch. The flights were done on a patch of common land near my house. At the top of a slight rise. I was joined on my second flight, by a red kite. Apparently my delta, hovering, slowly cruising up and down the ridge, was of some interest. Maybe it looked like I was hunting mice (the one that ate my Pronto, for instance) and he wanted in. Or he thought I was muscling in on his turf. He gave it a couple of minutes before loosing interest and lazily soaring away. Very nice indeed, Nigel. Lovely job. I am picking up a few new techniques and tricks to go with the foam board build methods. K = 0.22 for R/C model aircraft"
Dv, the fin's 25% point is close to wing TE, so that is (19" chord - CG position of 7" = 12"
Giving, 80 sq in as calculated size. That's rather large, 25% of wing area, and certainly much larger than the fin area I have currently. Current area of main bit of fin - tip, 5", root, 9", height, 6", giving 42 sq in. Only half the calculated area. Perhaps I need an extra 3" strip down the rear of the fin, I may try taping something on to see what difference it makes. Nigel, the Dekan Simple Delta is a low aspect ratio flying wing - a tailless aircraft. It seems different rules apply to them! Flying wings have short moment arms from the aerodynamic centre, implying the need for a large fin area to compensate. But that can increase drag too much. 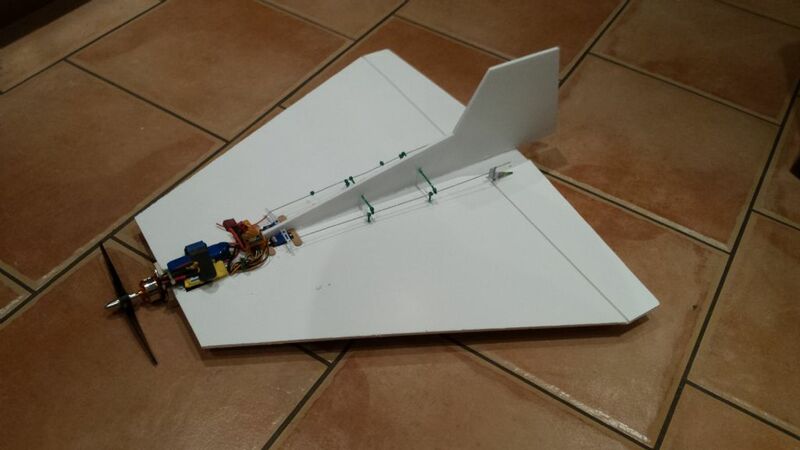 Lots of RC flying wings use alternative methods, such as extending the central fin on a boom, aft of the trailing edge. Thats a method that I use on "plank" flying wing slope soarers, and it is very effective, as it gives good yaw stability without adding much drag. Fine for hand-launch/belly landings, but hopeless for ROG and landing gear as the boom fouls the ground at high alpha. Other methods include using swept-back wings with much smaller fins outboard on the wing tips. This seems to be the most common method used on "chevron" designs, again very common on slope soarers. Interestingly, many swept-back flying wings have no vertical stabiliser at all. They can achieve yaw stability using twisted wings, and yaw control by using split-drag-tips. These operate like flaps/spoilers, except they open symmetrically, but only on the wing tip you want to slow down - the other wing therefore starts to overtake the dragged wing and induces yaw, much like tanks turn by braking one track and letting the other run on. Fascinating stuff with as many opinions, enthusiasts and detractors as you could ever hope for! Here's a close up detail of one of the depron fixed drag-tips. You can imagine that this will increase the drag at the tip, and if the other wing tip drag tip was in the "shut" position, then the wing would yaw around the open drag-tip. Dave, food for thought as ever, and yes flying wings are definitely a law unto themselves! The conventional rules of thumb do all seem to go out the window. The raked fins look an interesting variation on the Vulcan-A. I guess they are particularly effective given the prop-in-slot is right up close to them, less "nearly ducted" type benefit for a tractor setup? Today I flew the Dekan a couple more times. This time I had adjusted the movements at "rates off - slow speed" (about 60% aileron, 100% elevator) and "rates on - high speed" (about 40% aileron and 60% elevator), and I re-trimmed it for level flight at cruise throttle (2/3 ish) and just lived with the power off situation, where a fair bit of back stick is needed to keep the nose level (even if the thing is sinking). I wonder if this means I could go back on the CG? Anyway it was more pleasant all round to fly like this. Rolls are nearly axial with this setup. The reduced movements were a definite good thing at high speed. At low speed I still had loads of aileron control. A tiny bit of downthrust wouldn't go amiss at this point. Dialling it in, bit by bit. Anyway, this thing is a heap of fun for pocket money and next to no build time. I'm loving the speed range, walking pace high alpha, up to a good 40mph or thereabouts. The wing layout reminds me of the SAAB Drakken. Anyway, this thing is a heap of fun for pocket money and next to no build time. I once read somewhere that the amount of fun you can have with an RC plane is in inverse proportion to the cost of making it! Something expensive gives you The Fear. Nobody ever has fun when you have The Fear! Quick update, I've changed the motor. It's now sporting a 2500kv thing, spinning a 6x4 prop at lots of revs. This draws 220W! It is now quite fast. Although with the electrics hung out in the breeze, there is scope to make it faster with some fairing.